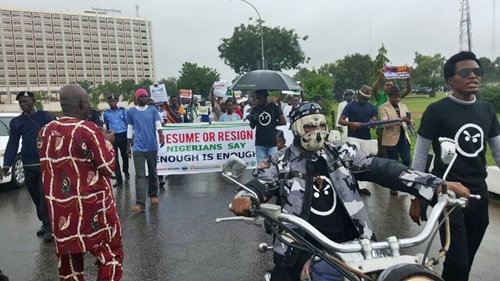 Concerned Nigerians, Our Mumu Don Do, and other social campaign groups, have commenced ‘Resume or Resign’ protest against President Buhari in Abuja. 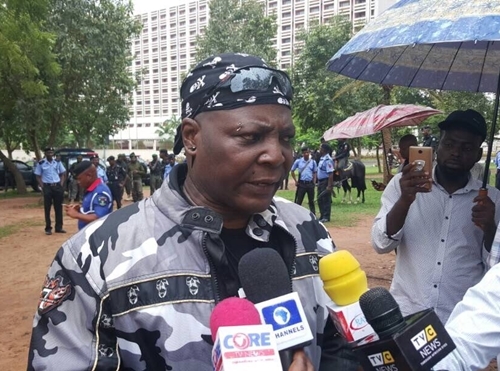 Legendary Nigerian singer and social crusader, Charles Oputa a.k.a Charly Boy, and the convener of Concerned Nigerians, Adeyanju Deji, have on Monday morning, staged a massive peace protest tagged, “Our Mumu Don Do”, in the federal capital Abuja. The activists who said that President Muhamamdu Buhari, has so far, surpassed 90-days on medical vacation in London, are calling on him to return and resume his duties or resign and stop spending tax payers money while paying for his medical bills. As at the time of filing this reports, the protesters have occupied the popular Unity Fountain in Abuja and speaking to news reporters and international journalists while calling on the president’s resignation. 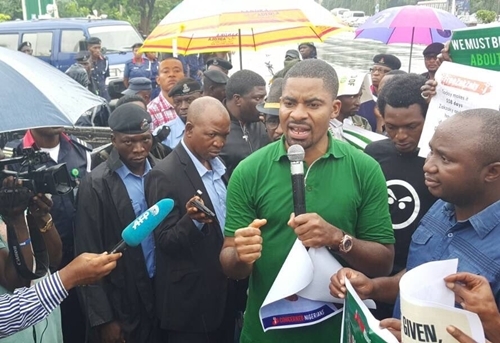 Deji Adeyanju during the protest.